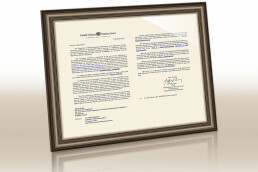 On September 8, 2010 around 740 members of the Intl. WeLoveU Foundation held a blood drive at the Daegu-Gyeongbuk Blood Bank of Korea National Red Cross in Daegu city. 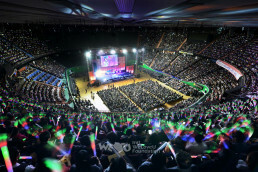 This event, which was held second time after the last year, was hosted by the Intl. WeLoveU Foundation and sponsored by Gyeongbuk National University Hospital and Daegu-Gyeongbuk Blood Bank of Korean National Red Cross. Lee Gang-min the Director of WeLoveU Foundation and Lee Gi-nam the Dirctor of Daegu-Gyeongbuk Blood Bank of Korean National Red Cross encourage the members who participate in the blood drive. Soon, medical examination and blood donation began in earnest. The members carefully read the instructions and filled out medical charts. They had a blood examination to check if they were in good health condition for blood donation. The faces of members, who were waiting for the result while having friendly talks with each other, looked half excited and half nervous. Among them, some members had to wait for next time, feeling sorry for low level of hemoglobin or being underweight. On the other side, those who were diagnosed as proper donors were getting on the bus for blood donation. 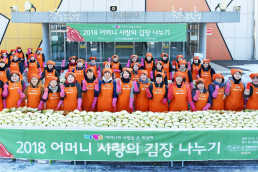 Although they had to wait for a quite long time due to many participants, all the members waited for their turn in good order with a bright look. Daegu IWF members participate in medical examination and blood donation. 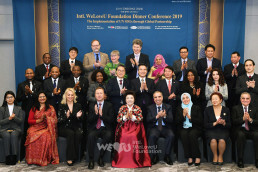 A member Jeong Yeon-ok (46 years old) who was a guide volunteer for the event, also talked about her experience; when her son was hospitalized due to a blood-related disease and needed to receive blood transfusion constantly, she could overcome such difficulty thanks to IWF members’ blood donation. On September 10, Lee Gang-min the Director of Intl. WeLoveU Foundation (middle, left) donates 270 blood donation certificates to Cho Yeong-rae the Director of Gyeongbuk National University Hospital (middle, right). As the line of participants rarely stopped, it passed way over the expected time and closed at around 6 pm. 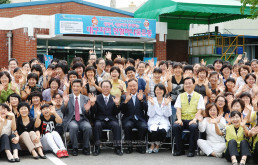 270 blood donation certificates of the participants were donated to Gyeongbuk National University Hospital on September 10 to be used for the patients with financial difficulty. The donated blood which is kept temporarily in blood bank will be used for the medical operation and treatment of urgent patients such as the patients with cancer and patients with leukemia etc. as a precious source of life.